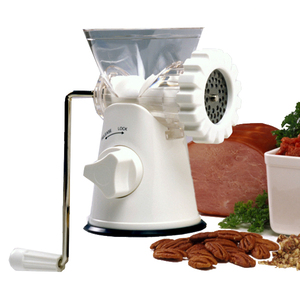 Mince and grind meat or make pasta all with one machine. Ideal for meats, beans, nuts and vegetables. Comes with two screens; coarse mincing plate and fine mincing plate. Includes a sausage funnel. Blades are stainless steel. Comes with three pasta attachments; rigatoni, spaghetti and linguine. Easy to assemble, use and clean. Comes with secure suction base and locking key. Instruction and recipe booklet included. Includes sausage funnel attachment.